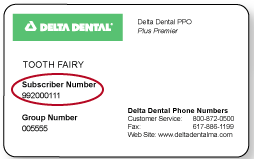 Your identification (ID) card lets your dentist know that you’re a Delta Dental of Nebraska subscriber. Be prepared to show your ID card to your dentist at every visit. To access your ID card on your mobile device, download the Delta Dental Mobile App. Group Name: This is the name of your employer group. Your Name: This is the name of the subscriber, or the person who is employed by the employer group. Subscriber ID: This identification number is important because it is used to process claims for the services your dental office provides. Your Group Number: This number identifies your employer group and the specific Delta Dental plan that your employer has selected. Your dental office will use this group number when submitting your dental claim to Delta Dental. Please Note: Your ID card does not guarantee eligibility for services. It is an information tool to be used by you and your dentist. Dentist verification and benefit predetermination are still required.